Highly successful local music store wanted to celebrate their half-century on the scene. The client concept was to feature rock music. They supply band instruments for students, but also professional gear for performers. It was time to remind everyone that the client has been rocking it since the sixties. 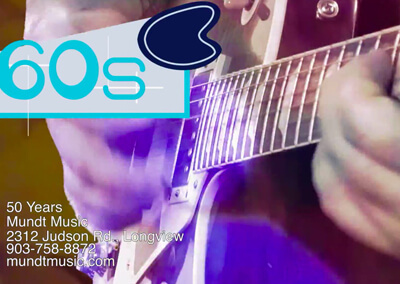 We asked the client to recommend a rock musician who could replicate the sounds of the five decades, recorded this artist performing these signature sounds, then edited the video with treatments reproducing the look and feel of the periods, even to iconic fonts. The result was a classic spot the client loved and the public responded well too.